BenRiach 15 Dark Rum Finished 15 46% abv. Part of the November 2006 "Wood Finish" series (the ones with the crazy colors on the labels and tubes). 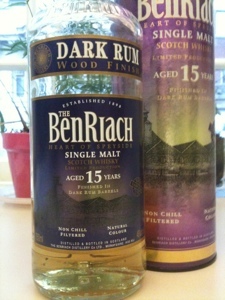 I have a hard time believing Benriach 15 Dark Rum cask finished single malt whiskey is really aged 15 years. It's tow-headed pale yellow: among the lightest colored whiskies I've ever seen. The aroma is nice - marshmallow, cake batter and butterscotch. With extended time a clear pineapple note comes to dominate the aroma. The pineapple and butterscotch aroma (pineapple upside down cake?) is yummy. On the tongue it is filigreed and lacy. Cerial honey, cake batter up front. There are some fruit esters at midpalate (apricot and sugar cane and white raisin) and distant wood notes at the finish which is moderately short. My issue here is that there is too little oomph. What flavor there is here is nice - but there's a bit too little for my taste. The flavors and aromas are lovely, but shy. The whole presentation is light in body, and too light in flavor density. Looking, smelling, and drinking this I would guess it has 8 years in the wood - not 15. That being said, it's sins are of omission. The flavors that are here are lovely. Update 11/6/12: Subtle nose with pineapple, and estery florals. A rather lovely Speyside nose augmented by the tropical fruits of the rum finish. On the palate I pretty much agree with my previous assessment except that I'm picking up whiffs of distant peat. It lacks intensity of flavor, but has sweetness with that sugar cane, rum raisin, and cake batter. 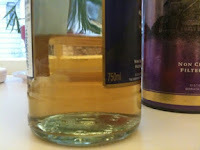 Also, I'm so charmed by the lovely floral speyside estery nose that I'm distinctly entertained and enjoying it. On the balance I feel I was a tad harsh on this one. Today I would rate this a 4 star dram. What happened? Bottle oxidation may have helped this one out. 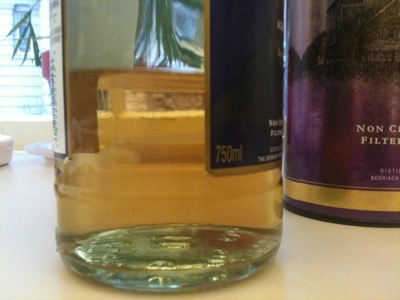 6 months at less than half fill allows the air ample avenues to influence the nose and palate of a whisky. Sometimes it robs a dram of intensity. Other times things relax and open up and begin to sing better. At 46% abv this one has some strength to give.